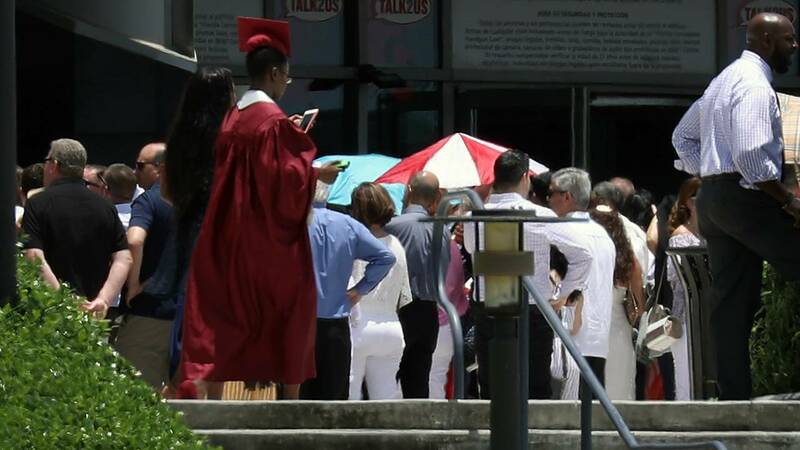 A graduate walks in her graduation gown as seniors from Marjory Stoneman Douglas High school, attend their graduation ceremony at the BB&T Center on June 3, 2018 in Sunrise, Florida. (CNN) - Silver and burgundy are the official colors of Marjory Stoneman Douglas High School in Parkland, Florida. But members of the school community used the color orange and other symbols to make statements without raising their voices at Sunday's graduation. Numerous members of the class of 2018 wore sashes bearing the message #MSDStrong, the school's rallying cry after the February mass shooting. Others kept the theme of gun violence front and center in Sunday's commencement ceremony. Orange is a recurring motif in the fight for stricter gun control, inspired by the color that hunters wear to protect themselves. As representatives of a generation that's saying "never again" to gun violence, some survivors of the shooting incorporated orange into their graduation regalia. Senior David Hogg, a prominent voice in the Never Again movement, wore an orange cap with a price tag for $1.05 attached to the tassel. According to Never Again, the price tag is intended to represent how much each student in Florida is worth to Republican Senator Marco Rubio based on how much money he received from the National Rifle Association. Some Stoneman Douglas teachers and students wore an orange-red color on their lips and under their eyes. The makeup came from the Lipstick Lobby, which will give proceeds from the sale of the shade to the Brady Center to Prevent Gun Violence. Teacher Jeff Foster wore orange pigment under his eyes as he served as ceremony grand marshal. Teachers Darren Levine and Ivy Schamis joined Foster in making a statement. Schamis wore orange lipstick. Senior Delaney Tarr, another well-known figure in Never Again, also donned orange lipstick for the occasion. Other used their graduation caps to send heartfelt messages honoring four Stoneman Douglas seniors who did not live to walk with their classmates. Senior Hannah Karcinell wore an orange cap decorated with a picture of her and friend Nicholas Dworet, who died in the shooting. "We will fight for you," a message on the cap read. Friends and relatives accepted diplomas, caps and tassels on behalf of the deceased students. The mother of victim Joaquin Oliver wore a yellow shirt declaring "This should be my son" as she accepted her son's items. After Joaquin's death, his parents founded the advocacy group Change the Ref, which aims to train youth activists and diminish the influence of the Nation Rifle Association. The brother of Meadow Pollack accepted his sister's diploma for his family. One of Meadow's friends wore a cap adorned with a photo and a message. "We are still in this together."